There’s no doubt about it – the all-new 2014 Chevrolet Corvette Stingray stole the Detroit Auto Show earlier this month. A bold evolution of the historic Corvette lineage, particularly in terms of styling, the 2014 Corvette is already drawing comparisons to exotic supercars costing many tens of thousands of dollars more. A common assumption about Corvette buyers is that they know exactly what they want when they’re shopping for a car. To test that theory, we took at look at the current-gen 2013 Corvette and used exclusive CarsDirect cross-shopping data from the past three months to take a look at the top five vehicles cross-shopped against the 2013 Corvette. Interestingly, the 2012 Corvette was cross-shopped against the 2013 Corvette at a rate of 18.5%, besting all of the new models listed above. It’s unusual for a new car to be shopped against a used version of the same car at such a high rate. So perhaps the theory is correct: the only thing you can compare a Corvette to is…another Corvette. Want custom cross-shopping data for your vehicles? Contact us at 866.852.3784 or connect@carsdirect.com. The new CarsDirect DX dashboard shows you where your leads are coming from at a glance. The online car buying consumer has changed quite a bit from the early days of automotive e-commerce. Remember when potential customers would give you any amount of information you asked for, and it was much easier to track where they started their search? Full names, addresses, multiple phone numbers, e-mail addresses – and they were all REAL! Now, everyone is anonymous – and good luck finding out where they originated their research. At CarsDirect, we’re still often asked, “What’s my CPL?” But that metric has long been misunderstood, and not used to effectively gauge ROI. Fact is, there is still too much negotiating to the lowest possible CPL. While it seems like a game (and dealers, being the best negotiators on the planet, sharpen their skills with their “lead providers”), it can cost you quality and quantity in your marketplace. What’s not widely known is that there is a lead for every price point, and you get what you pay for. So be careful the next time you think you’re going to “win” by shaving a couple bucks off of your CPL. As part of Internet Brands, CarsDirect is a full-fledged online media company with powerful visitor traffic to our family of websites. We see consumers coming from so many places beyond the traditional lead. 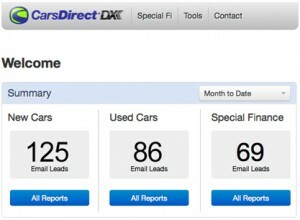 As a result, we developed a new tool that is the centerpiece of our recently redesigned CarsDirect DX (Dealer Extranet). This powerful tool helps our dealers see the total advertising value of working with us. This includes phone calls, chats, print-outs of dealer info (leading to floor traffic), clicks to the dealer’s website, and branding impressions across our network of 100+ online automotive community destinations. We now provide much better visibility into the broad spectrum of value a dealer gets when they spend their targeted budgets with us. I’ll admit that we weren’t so good at this in the past, and some of our competition had done a better job. But the playing field has leveled, and the access to our reporting data and analytics is powerful. Our new DX is a destination you’ll pin to your quick-launch toolbar to always understand total advertising value, and all of the ways we’re working to bring customers to your door when working with CarsDirect. If you’d like a personalized demo of how the new CarsDirect DX can help revolutionize the way you look at advertising ROI, please don’t hesitate to contact me directly at (310) 280-4282 or at todd.dearborn@carsdirect.com. We’re always working to create products that mutually benefit consumers who visit CarsDirect.com and our dealer partners. We’re especially proud of our latest new product: CarsDirect’s My Showroom. This industry-first feature lets consumers who visit CarsDirect bring their friends along as they shop for a car, creating a social car buying experience that leads to more solid leads for dealers. • Fast social log-in. Consumers can quickly sign into CarsDirect and configure their personal showroom using an existing social network account such as Facebook, Twitter, or LinkedIn. • Save vehicles. As consumers browse vehicles, they can save an unlimited number of new and used vehicles that they’re considering to their personal showrooms with one click. • Share vehicles. Consumers can share their list of saved vehicles with friends on Facebook, Twitter, and other social networks. Their friends can then vote and comment on the vehicles under consideration to help make a purchase decision. For years, CarsDirect customers have been telling us that that they value their friends’ opinions highly when it comes to which car they choose. We think that My Showroom will help lead to more confident purchase decisions by CarsDirect users, resulting in even more solid and more qualified leads for our dealer partners. In fact, our early data shows that consumers who use My Showroom are more than 10 times more likely to convert into a lead than consumers who don’t use the feature. You can learn more about social car buying and CarsDirect’s My Showroom at http://www.carsdirect.com/social. At the Digital Dealer 13 conference, CarsDirect Vice President of Sales Todd Dearborn hosted a well-attended dealer education session titled “Why You’re Not Closing More Sales.” The session shared actual, exclusive 2012 CarsDirect customer survey data on why they aren’t buying from dealers. This data had not yet been revealed publicly and aggregates thousands of recent survey responses from customers who submitted leads on CarsDirect.com to dealers and to CarsDirect’s in-house auto brokerage business. The workshop also explored the latest buying trends, reasons customers aren’t buying, and how dealers can change their current processes to immediately improve their closing ratios. Additionally, Todd covered lead sources and the content consumers see online prior to submitting their leads, and how to use this context to prepare to meet customer expectations and sell more cars. Click here to watch a video of Todd’s session. I recently had the opportunity to lead a dealer training seminar at the Digital Dealer 13 conference in Las Vegas. 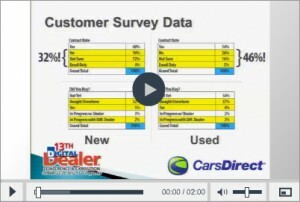 I focused my session on using real CarsDirect customer survey data to figure out the reasons why customers didn’t buy from the store their lead was originally referred to in those cases when customers ended up not buying, or buying from another store. You can see a video of my session here. 1. Customers aren’t being contacted. • 32% of New Car leads and a whopping 46% of Used referrals aren’t being contacted, per our data. • The customer’s perception of 1:1 contact differs from the Internet Sales Rep’s perception. • In these cases, the sales rep and ISM give up, whether due to cherry picking, working too many leads or just bad process. The customer says “I’m still looking – but call me.” They’re open to alternative solutions, and they still are ready to buy a car. Fix it by implementing a better process for the 7+ to 14+ days aged lead. Make sure you have a trained sales person working on follow up, armed with solutions to meet the customer’s needs. Customers’ expectations change based on what their research and inquiries have told them, and you can take advantage of this. • The outdated but still widely used philosophy is to prioritize getting the customer into the store, and to hold price hostage until the customer does show up in person. Fix it by knowing that data is too plentiful, and that there are dealers ready to talk price. Prepare yourself using tools like vAuto and doing research to know where other dealers in your market are priced. You can also go to CarsDirect, TrueCar, Edmunds, and other places to find new car pricing by market. We have sold well over 100,000 vehicles (almost entirely in California) through our brokering business to customers we have never met and never laid eyes on. We designed our communication to fit into the customer’s buying process, not force them into our selling process. The best dealers executing the highest sales rates understand this dynamic. They’ll do dealer trades, search for used cars all over the country using things like the online wholesale auctions, and they have delivery solutions for their customers. Treat the call center/phone sales job like the description says – look at dials, talk time, lead conversion cycle time. How many leads does your sales rep handle? Do they turn and burn, or are they a plodder holding on and not able to take on the right volume? If you manage to their strengths then there are big rewards. But most of all, you need to make sure you understand why customers do and don’t buy from you. Why Aren’t Customers Buying From You? In today’s world of the Internet, smart phones, and apps for everything, communication is supposed to be easier and more efficient than ever before. But when it comes to dealers communicating with potential customers, plenty of opportunities are still slipping through the cracks. That’s one of the major takeaways from our latest exclusive quarterly survey of customers who submitted leads on CarsDirect.com. Looking at the first chart a full 41% of consumers said they either weren’t contacted by a dealer or were not sure if they were contacted. In today’s world, there’s almost always a way to reach a potential customer, but almost half of leads are passing by unconverted due to something as simple as making initial contact with the customer. To avoid missing these opportunities, focus on what customers see as making contact, and on your current process at your store. While your process might consist of sending an e-mail shortly after receiving a lead, it could be that the customer is expecting a more personal phone call. Experiment with different ways of making initial contact with customers to see which one garners the best response. As illustrated above, there are plenty of opportunities other stores are missing that you can seize on. Moving onto the second chart, again we see that by far the top reason or not purchasing: no contact. If there’s no communication with customers, it’s impossible to make sales. That’s why it’s imperative to examine and refine your processes so your sales team knows they did everything they could to contact a customer and get them in the door. The second most-cited reason customers gave for not purchasing was that they are still looking for a vehicle. These are the cases when contact is made with a customer but they drop off the radar. In these cases, it’s important to examine why your team hasn’t closed the customer. Are they still working the customer? There’s usually plenty of opportunity to win a customer back if they’re undecided. Finally, the third most common reason that customers gave for not purchasing was price. Here, make sure that you’re giving customers a price online so that there is no surprise about price on first contact. Also, make sure you’re priced competitively in your area. It sounds simple, but your prices could be out of line with the rest of your local market if you’re not keeping tabs on pricing trends in the surrounding area. We like data around here, and we think should you, too. All too often I hear people say, “Don’t get analysis paralysis.” Personally, I think that type of philosophy is a bit short-sighted. You need to know when to take action. That’s the goal of looking at data: use it, and take action. But sometimes people have a tendency to “admire the problem”… and that wastes everyone’s time. That was my first thought after seeing an article last week about the vAuto integration getting tighter with the Auto Trader side of the business. There’s also HomeNet, which controls inventory distribution to the online channels. We then cross the great divide to retail, with KBB driving retail values, Trader as the marketing channel, and now vAuto showing comparative retail market pricing to the consumer (so you can make sure you’re priced in the upper quartile for most competitive pricing). Holy cow – talk about driving a race to the bottom! This has gone beyond visibility, data, and analytics and crossed into what seems to be an uncomfortable level of control over a dealer’s inventory, the price at which it’s acquired, and how much it’s sold for in the retail space. What’s happening with the level of control Cox now wields over a dealer’s supply and demand should make any business owner consider whether or not this is healthy for the industry, and for the market as a whole.